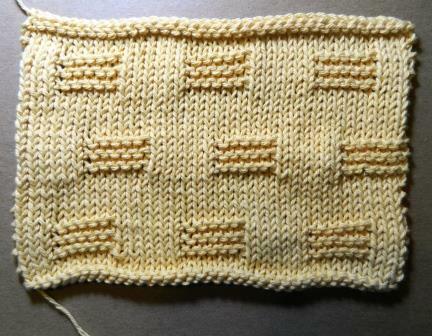 This is Week 3 of Stitch Pattern Saturday. This week I knit the Garter Stitch Cobblestones pattern in the 400 knitting stitches book by Potter Craft. It was done on U.S. Size 7 needles with worsted weight cotton. I repeated the 24 row stitch pattern 1 1/2 times. It measures 9 inches wide and 6 1/2 inches long. This is a great stitch for dishcloths. Another use might be as the edges for a blanket when used with another stitch pattern. I’m adding this to my stitch pattern notebook for future projects.